By 2013, it had become apparent that no solution to the housing crisis was going to emerge unless it was driven from within Leinster House. No member driven legislation appeared to be forthcoming. Following an invitation to attend finance committee a small group set about driving the enactment of a ‘People’s Bill’. 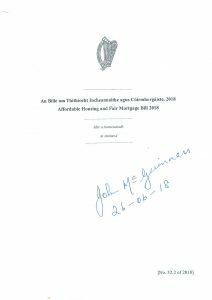 Distressed by the number of cases before his court, Edmund Honahan, Master of the High Court went on to draft, and at the behest of the Bills Office & later the Ceann Comhairle’s office, has twice amended The Affordable Housing and Fair Mortgage Act. It is awaiting debate and has been supported by Independent TD’s, the Green Party, People Before Profit, Labour & Sinn Fein.